When my mom passed away last year, my sister dutifully took over taking care of our father. I helped out on weekends, but I worked a full-time job. My sister helped Dad out on her own most of the week. She spent nearly every day with our father making certain that he feeds himself, made it to doctors's appointments, and even that he got out for walks ("shuffles" as he calls them) twice a day. While he lacks his youthful mobility and eyesight, our dad is in great health and wonderful spirits. He and my sister have a great relationship - it's fun to listen to them joke back and forth about the weather or current affairs. My sister put her life on hold to start taking care of him when Mom passed. Originally she was supposed to go back to school, but she paused those plans in order to spend more time with Mom, and to help out with Dad. I love my younger sister. She is young, vibrant, and full of energy. She is also a natural caretaker. She always places other people's needs first. I admire this aspect of her character, but I also worry about her living her life. I appreciate all that she has done for our family, our father in particular. However, I wanted her to remember to take care of herself. I sat my sister down and asked her about her goals for the future. She wistfully mentioned school, but seemed to dismiss it as a fantasy. She started to resign herself to a life caring for my father. If I thought this path held fulfillment for her I wouldn't give it a second thought. However, I knew how much she wanted to continue to study physical therapy and have a career of her own. While her personal efforts to keep our father active and mobile inspired me, I knew she wanted to accomplish more in the field. We talked about our options. I offered to move down to part-time work, but realistically it does not make financial sense at this time. I carry my families insurance and cover a lot of expenses for my sister and father with my salary. We also talked about a retirement home. While the idea of a retirement home isn't as off-putting as it used to be (My husband wanted to move into the one we visited when we were exploring options), both my sister and I decided we are more comfortable with our dad at home. Dad's kind of an introvert, and we figure that home care suits him better. We both thought that a personal caregiver would be too expensive, but after some research found options for senior caregivers that fit within our budget and Dad's needs. We hired a personal caregiver on for three days a week. So far the service is working out well. Dad was initially shy around his caregiver, but has since opened up to him. They like to play cards together, and watch ballgames. 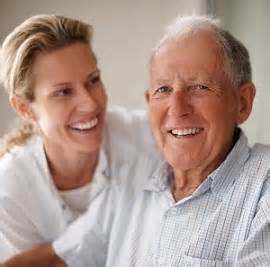 The caregiver makes certain dad meets all of his appointments and take care of whatever is needed. My sister still stays with my dad twice a week, but as her course load intensifies we will need to move to full-time care. It's going to be a tight financial squeeze, but we can make it work. Seeing my sister graduate next spring will be worth the extra belt tightening.